Greenscapes is a family owned company with strong ties to the Manatee/Sarasota area. In 2014, in order to give back to the community, Greenscapes introduced Greenscapes Giving Green. Through the Greenscapes Giving Green program each year Greenscapes donates a landscape enhancement to one non-profit organization in the area. The chosen project is completed by Greenscapes at no cost to the beneficiary organization. The 2018 winner of Greenscapes Giving Green award was Meals on Wheels of Sarasota. Meals on Wheels delivers hot meals and warm smiles to residents in need through the help of 550+ volunteers. Each day 500 heart-healthy meals are prepared, packed and delivered to seniors, veterans, children and families who are unable to shop, plan or cook meals for themselves. In addition to feeding homebound residents, Meals on Wheels volunteers perform safety checks and provide a warm and caring human connection. Their clients range in age from 3 to 104, are spread across a 600 square mile delivery area. No one is turned away, regardless of ability to pay. 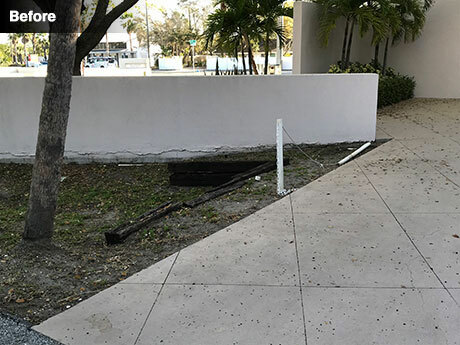 They asked Greenscapes to undertake some landscaping work at their North Lime Avenue center. 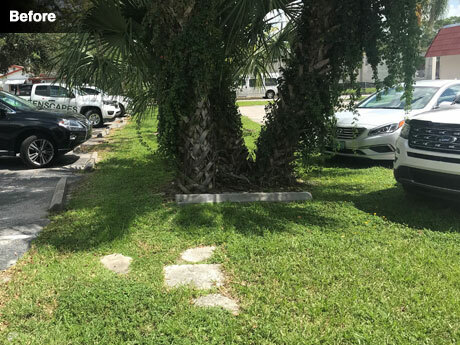 They needed two safe pathways connecting the parking lot to the entry and plants installed to approve the appearance and help guide visitors to the paths. "We were thrilled to win Greenscapes' annual competition. The beautiful landscaping and safe pathways are a welcome change for the volunteers who help us prepare, pack and deliver healthy meals to our neighbors in need, six days a week. Members of the Board have noted the improvement in appearance, referencing how clean and open the space is. The volunteers are all really complimentary. Believe me, when it rains, the safe walkways are really appreciated. Greenscapes has made this possible, and we are both grateful and delighted." 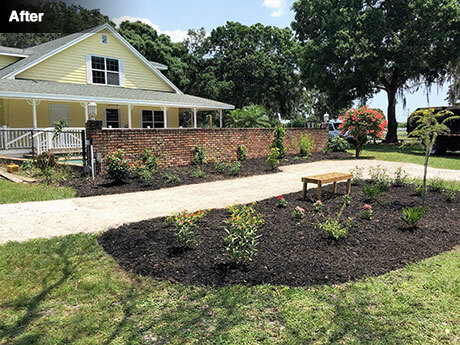 Once irrigation was installed to support the new plants, we planted 3 gallon hibiscus and 7 gallon crape myrtle. The hibiscus will grow in to camouflage the ugly meter. 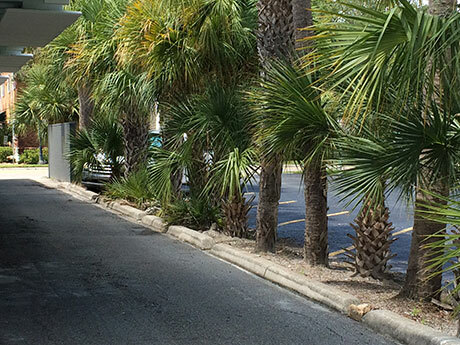 The removal of two old trees enabled another path to be installed and crape myrtle planted. Unsafe, old step pads were removed. The plants will take about a year to show fully. The 2017 recipient of the Greenscapes Giving Green Award was the Women's Resource Center. For more than 35 years, the Center has provided support and direction to women of all generations, to encourage, educate, enrich and empower them through life's transitions. Their mission is to provide counseling, education and training which leads to emotional and financial fulfilment. 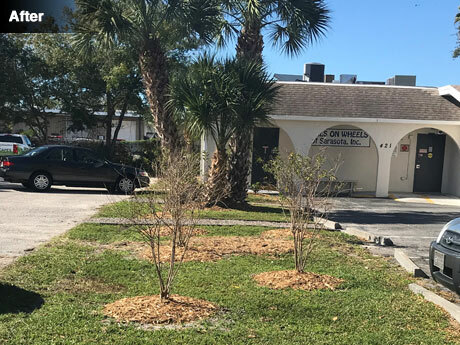 Today, the Women's Resource Center serves over 6,000 women and their families through their offices in Bradenton, Sarasota and Venice. 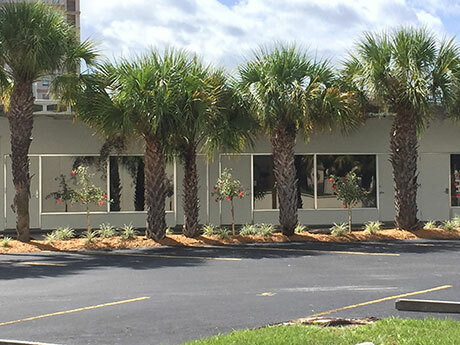 The Center asked Greenscapes to donate our gift in kind to their office on South Tuttle Avenue, Sarasota. 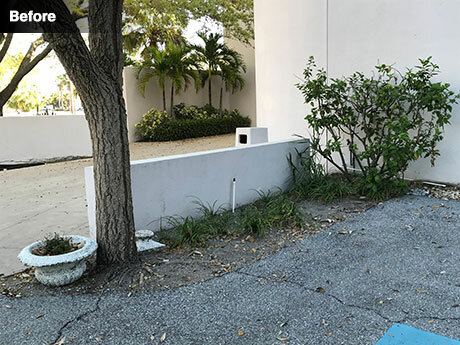 They asked us to assess and repair the landscape irrigation system and update the landscaping at the front of building and in the parking and patio areas. "We are so appreciative of Greenscapes! WRC was the recipient of this years' Greenscapes Giving Green Award. We were given the opportunity to work with them on a landscape project. 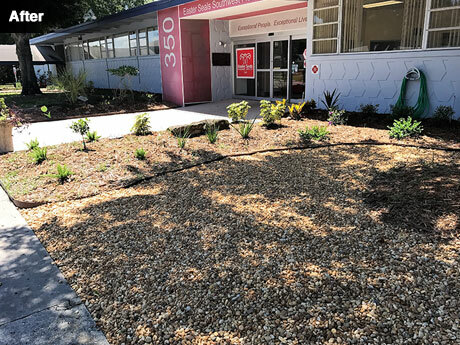 For us that meant repairing our irrigation system and beautiful new landscaping at our front entrance to welcome our clients. All the services and material were donated by Greenscapes! Greenscapes had a terrific team representing them in the field; they were knowledgeable, professional and easy to work with. Thank you Greenscapes for investing in our community and making it more beautiful in the process." Greenscapes replaced the irrigation controller and repaired the system. 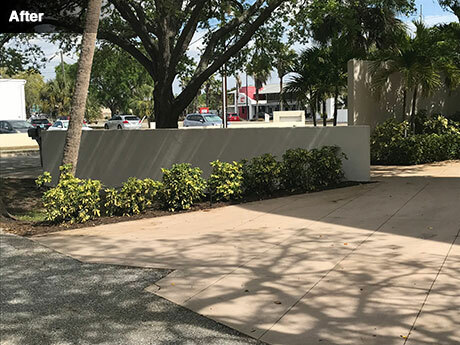 We planted Variegated Arboricola on the north side of the building and installed top soil, Hibiscus, Green Island Ficus, Blue Flax Lily and a Gold Tree on the south side. We re-potted two pots on the walkway to the front door with potting soil and Ti Plant "Auntie Lou". Finally, we neatened all the beds with Cocoa Brown Mulch. The new plantings will need about 2 years to grow in fully. 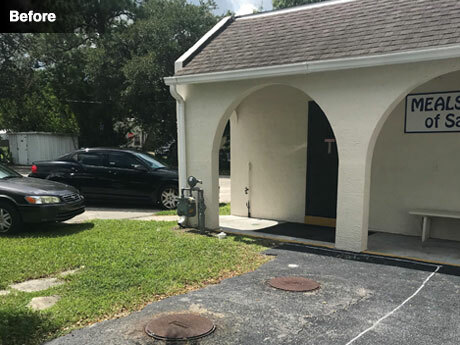 Their center, which is based on Braden Ave in Sarasota, is used by a variety of service users, however they felt specifically "the entrances were looking old and sad". 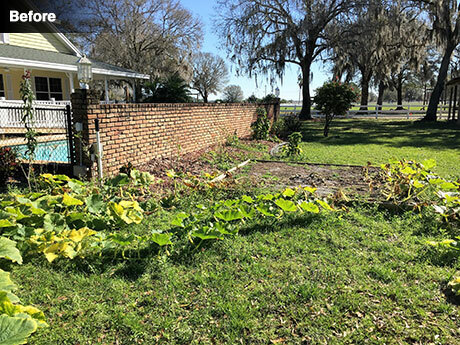 Plantings died and needed to be replaced with Florida native plants. 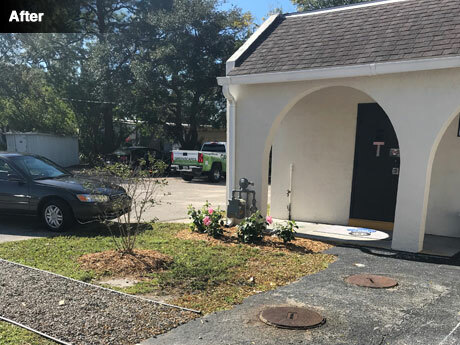 One of the front doors at Easter Seals is an entrance to their pre-school; they wanted the area revitalized so that children enjoyed the beauty of simple Floridian plants. "Easterseals is thrilled to have been chosen by Greenscapes to receive their beautification grant for the main entrance of our campus. Having served our community for 70 years, we are so grateful for grants such as these that allow us to maximize our funding in the critical programs that change lives! From the onset, Greenscapes shared a wealth of information on this project. They created a 2D design that was a great replica of the design and allowed us to truly picture the type of plants and the hardscapes involved. 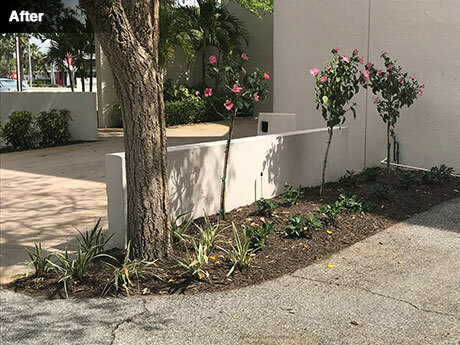 Greenscapes made sure that every detail was covered from the type of plants that would flourish to the irrigation coverage to the ongoing maintenance. It was obvious that Greenscapes takes great pride in their work and its longevity. The team arrived promptly, finished as scheduled – leaving it beautified and clean. They were courteous and conscientious. Thank you to the whole Greenscapes team for beautifying our community through your generous grants! We appreciate YOU!" Entrance cleaned up and weeded. 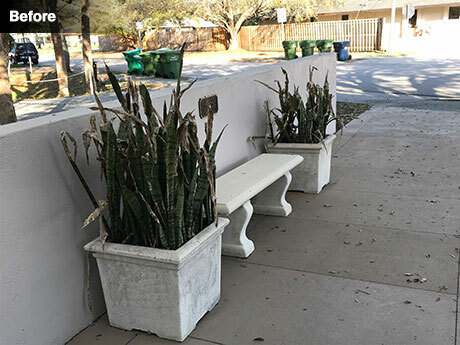 Plantings included Variegated Arboricola, Gardenia, Carissa "Emerald Beauty', Croton 'Petra', Pinwheel Jasmine, Dwarf Tibochina, Ti Plant 'Red Sister', Queen Emma Crinum Lily and African Iris. 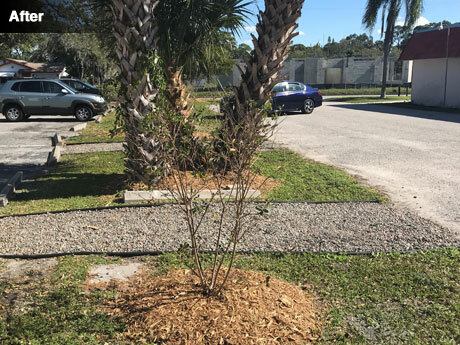 Mulch was laid in the beds and brown river rock was laid around the tree to neaten and help prevent weeds and water loss. The entrance will need two years to grow in and present fully. The 2015 recipient of the Greenscapes Giving Green Award was Sarasota Manatee Association for Riding Therapy, known as SMART. SMART has been in operation since 1987. Its mission is to provide therapeutic horseback riding, carriage driving and equine assisted activities to children and adults with disabilities. Through respectful partnerships with horses, they create an environment which promotes a life of inclusion, respect, growth and independence. 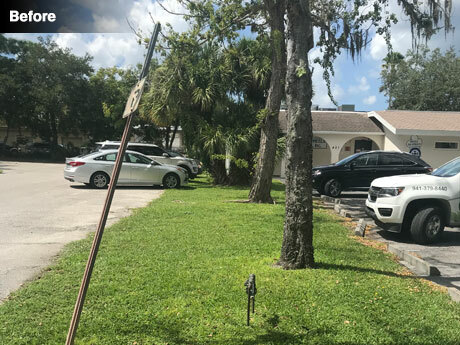 At their farm, which is based on County Road 675 in Bradenton, SMART aims to provide a place of respite for riders and their families. They had been working for some time to install a wheelchair accessible Sensory Therapy Garden as a source of peace and inspiration. To help complete the project Greenscapes created a Butterfly Garden offering a wide variety of smells, colors and textures. "Thank you to Greenscapes for the wonderful grant in kind creation of our beautiful Butterfly Garden as part of our Sensory Therapy Garden. The participants, their families and our volunteers all love it! The Greenscapes team was a pleasure to work with and they had butterflies flying around the garden before they even left. The garden is growing and looking increasingly beautiful and there are more butterflies around our farm every day. Thank you so very much." Plantings included Milkweed, Dwarf Ruellia, Buddleia, Parsley, Dill and Fennel, Coontie, Jatropha, a Cassia tree and many others. The butterfly garden will need about a year to grow in and present fully. The 2014 recipient was the Center for Architecture Sarasota. The Center is committed to the preservation of our rich and diverse architectural heritage, promotes innovative design and encourages sensitive urban planning. It provides educational programs for its members and the general public. Programs include lectures, films, exhibits and conferences as well as K-12 programs to teach the importance of preservation and future sustainability of the built environment in age-appropriate applications. 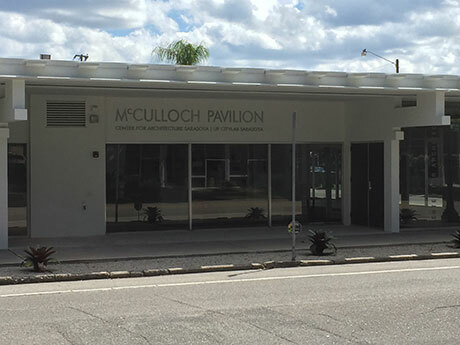 The Center for Architecture raised funds for and oversaw the renovation of the building located at 265 South Orange Avenue, where it is now based, alongside the University of Florida Master of Architecture Studies, known as CityLab-Sarasota. 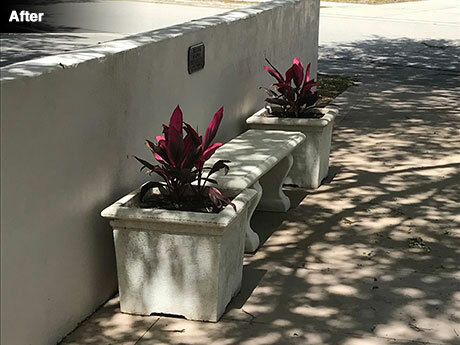 Greenscapes helped beautify the space immediately around the building, demonstrating the role landscaping plays in supporting good architecture. "Center for Architecture Sarasota is very proud to be the first recipient of the Greenscapes Giving Green award. The Center acquired possession of the property at 265 South Orange Avenue in February of 2014. 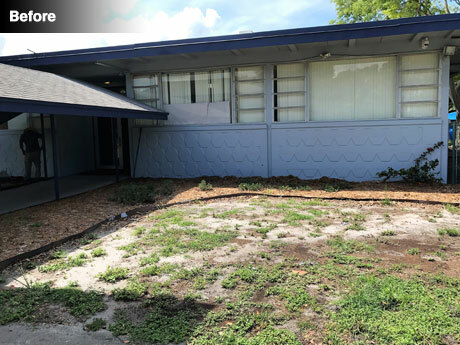 A complete renovation of the building was completed in March of 2015, but the surrounding landscaping had been neglected for quite some time. Greenscapes transformed this unattractive area into a site that is lovely to see. 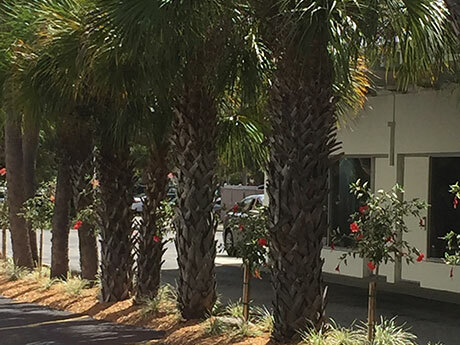 Instead of being a detractor, the landscaping now enhances the beauty of the newly-renovated building. We are very grateful to Greenscapes for their generosity and their contribution to the community." A mass of unkempt palms. An attractive view from the classrooms and lining the parking lot. Fewer palms, properly trimmed. Snow Queen Hibiscus bringing color. Variegated Liriope providing ground cover and Cypress Mulch to neaten and help prevent weeds and water loss. It will need about a year to grow in and present fully. Bradenton Web Site Design & Expert SEO by: Noble Webworks, Inc.